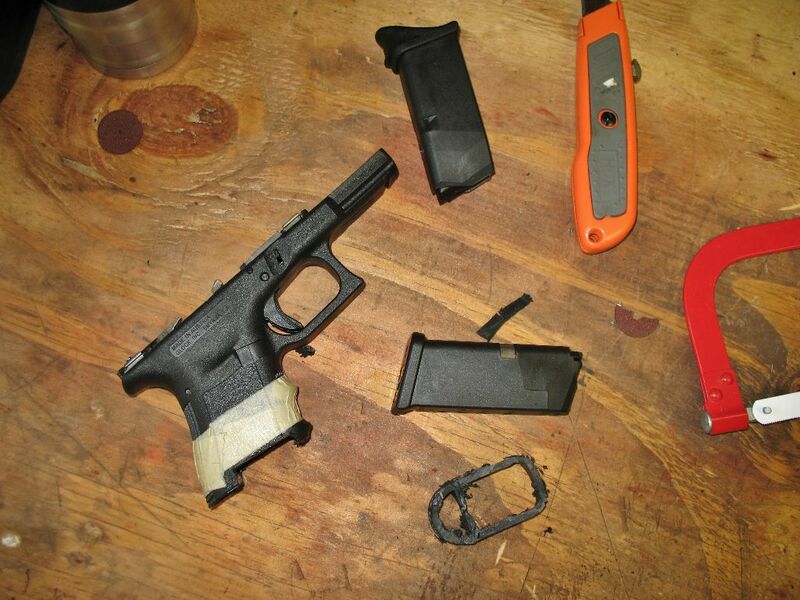 This is the crazy tale of killing a GLOCK 19 to make it a 26L. 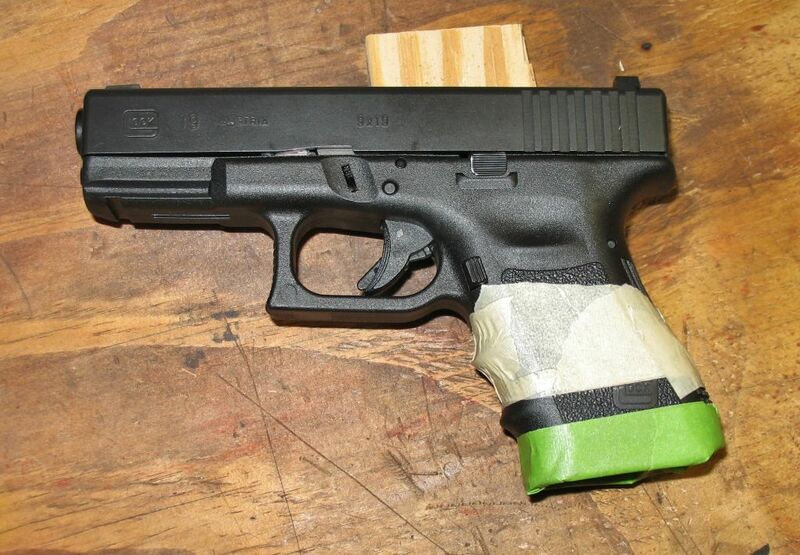 I have randomly been thinking about this for a while; chopping a GLOCK 19 down to a 26 length grip. I kind of like the GLOCK 26 but not enough that I would ever buy one. Really the only thing I like about the 26 is the grip length. I am not really a fan of the shorter slide or the 10 + 1 capacity. If I were to buy one, I would only use it 30 – 90 days a year and I could never justify it. If you love your 26, I mean no disrespect, I am just privy to the 19. So Pincus kind of went a little crazy here and I think he wasn’t thinking this whole thing through. I think he rushed it so he could get it on video and later regretted rushing it. He just did one fast cut without working the cutout for the front lip of the rear tail on the 26. These two pieces make the 26 far easier to shoot, especially with the Pearce grip extension. Pincus after the fact sent his cut down 23 over to Business End Customs to have it reworked. Business End Customs to their credit did a hell of of a job. You can find the whole write up HERE and this forum post that walks you through the fixing of Rob’s 23. Everything Rob is saying in the video about the 19 and 26 is spot on. If you appendix carry, the grip of the 19 has a tendency to stick out a bit. I have never had someone call me on it but its something I’m cognizant of.That being said the 19 has a longer sight radius and little more weight out in front so the recoil management is easier. The 26 on the other hand with its shorter grip conceals much better but you have the negatives as stated above. So all this being said I was not going to go out and by a new GLOCK 19 and cut it down, thats slightly crazy. But a few months ago I was able to pick up a Gen 2 19 that was a police trade in that I wanted to have for my collection. The frame was in good shape but the slide had seen better days. Never fear as I knew you could send the whole gun back to GLOCK to have all its parts replaced and have the slide and barrel refinished. She came back to me in about 3 weeks looking brand new except for the fact it was a Gen 2. Around this time I saw that One Source Tactical was selling GLOCK 19 frames for a good price and since my Gen 2 slide would fit on the Gen 3 frame, this all looked like it may work out. So I pulled the trigger and OST had my frame sent off to my FFL. At this point I was thinking that maybe I would do the work but chances were good I would just send it off to have it chopped down. That’s until I looked around at the prices for this type of work. You would be better off just buying a 26. Frame in hand, I needed some dimensions and since I don’t own a 26 I headed off to my local gun shop who was cool enough to let me trace out the 26 grip onto the 19 frame. Don’t ask of what they thought of all this. Next step was just sitting down with a dremel, hack saw, and lots and lots of sandpaper. 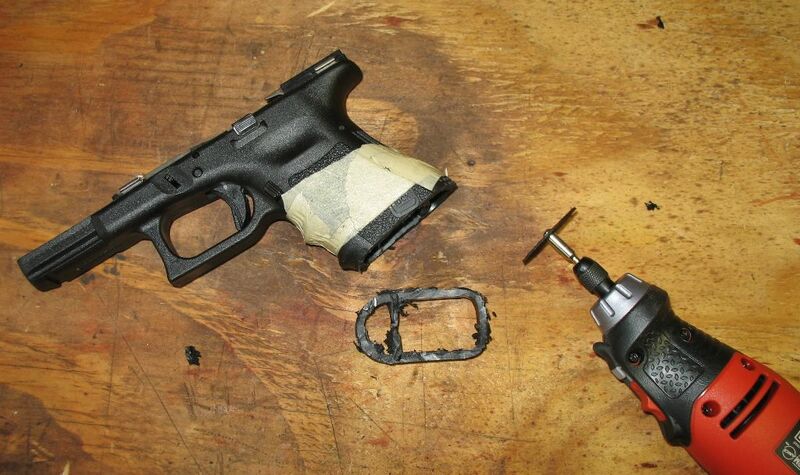 I found a good write up of a guy chopping down a GLOCK 31 who looked to do what I wanted to do with some excellent pictures. If you are going to try this I would highly recommend bookmarking this step by step. First step as I mentioned was to get the 26 frame size stenciled on the 19 frame. I taped it off where I knew I would end up. I then taped about a 1/4 inch below where the front lip and tail line up on the 26. First cut was on the green tape line. Next was to cut out between the lip and the tail. I did 3 vertical cuts with a hacksaw and cut the horizontal with the dremel. I think this would work better with a bandsaw but I don’t own one. Now I started the slow process of fitting a 26 magazine and hand sanding to get where I needed to be. I was very conscious of going slow and not rushing. 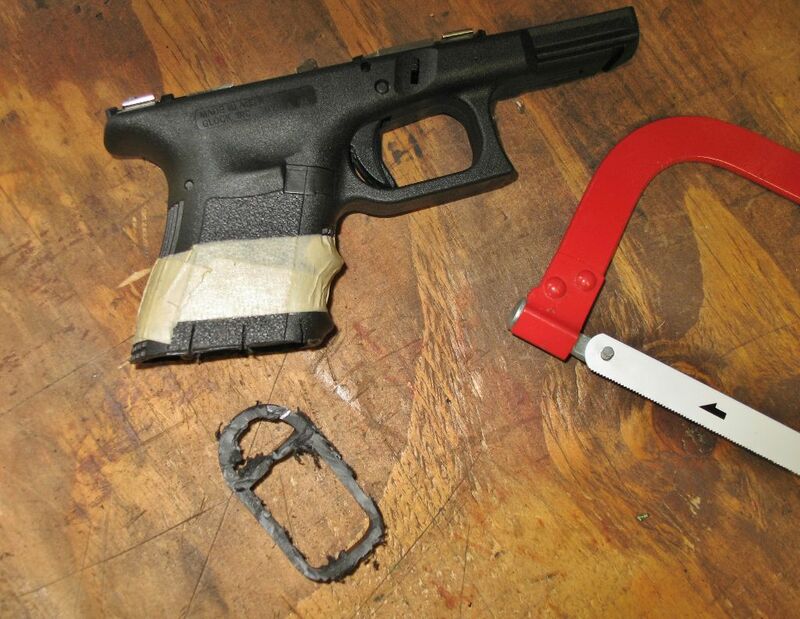 Here is a tip that I wish I knew – the cut for the tail will be directly behind the back of the magwell. I went a little past that, not enough to piss me off but in the end that is the measurement to get the back of the mag base plate to fit. On a Gen 3 frame the front lip is cut right in the middle of the second finger grove. The Pearce grip extension was helpful here as it’s the other half of the puzzle. As you sand forward so you can get the front of the mag base plate to fit, you will see that this is what determines the the lips width. 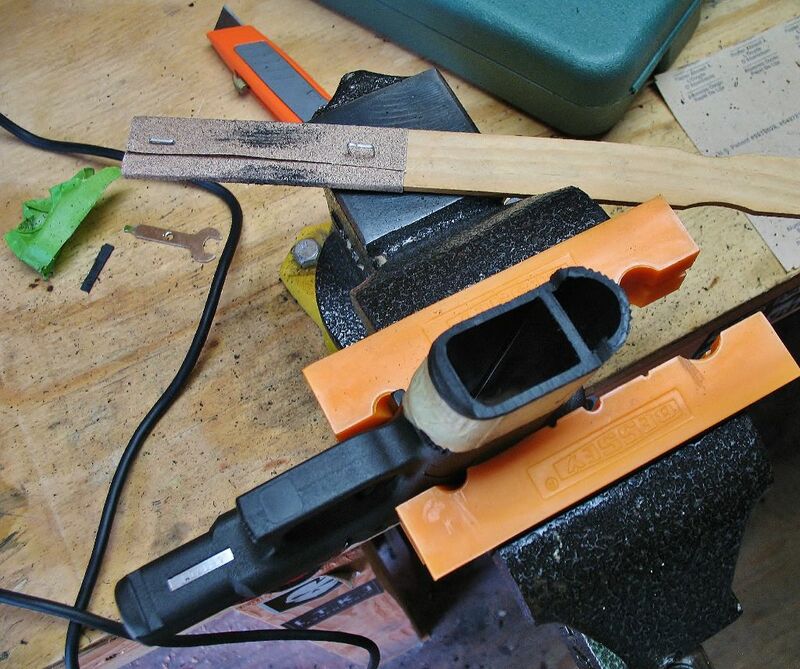 You dont need to measure it, just keep sanding forward and when the base plate fits your done. I did most of the hand sanding with a paint stirrer wrapped with sandpaper. I started with 150 and worked up to 220, 400, 800 grit. The 800 will put the factory look on the bottom. The vise was super helpful although you could do it free hand after the cuts if you don’t own a vise. 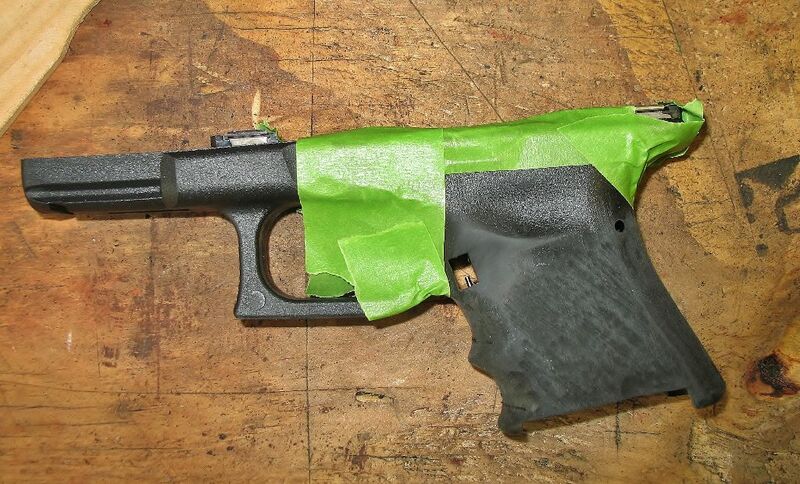 Next I sanded off all the GLOCK texturing from the grip and beveled out the mag release. This makes stippling easier and also it is very difficult to hide the differences in height once you stipple it. I see guys send off their frame to get stippled all the time and the smith doesn’t do this simple prep work. I think the result is bush league. Let the stippling begin. I do the grip, under the trigger guard and the side thumb rests. 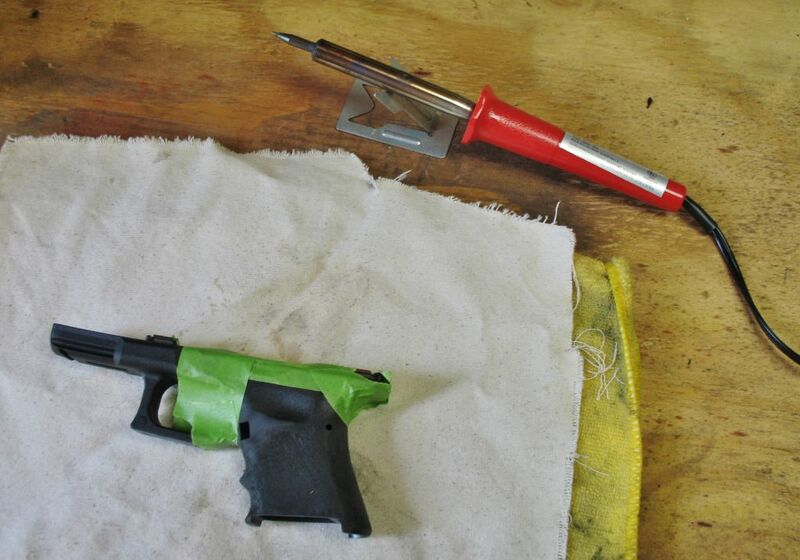 I also try to sand down the trigger guard to help with GLOCK knuckle. I do all my stippling with a $10 soldering iron from Amazon. All done with some rounds downrange. I need to check it with defensive ammo this week but so far so good. If your thinking about doing this I would recommend getting a second frame. That way you have a 19 and a 26, you just need to swap the slide. Other than that, see if you can get your hands on a 26 for the measurements, if not you could do it with just the 26 magazine just go super slow. It was scary going in but once you get the mag to fit it’s all just finish work from there. In the end it probably took 3 hours from start to finish with the stippling. It turned out better than I thought it would and it conceals like a dream! Hope this helps if you are thinking about chopping a 19 down to a 26L. I have been running the 26L as my primary carry gun for the last 8-9 months. The gun is a dream to shoot. 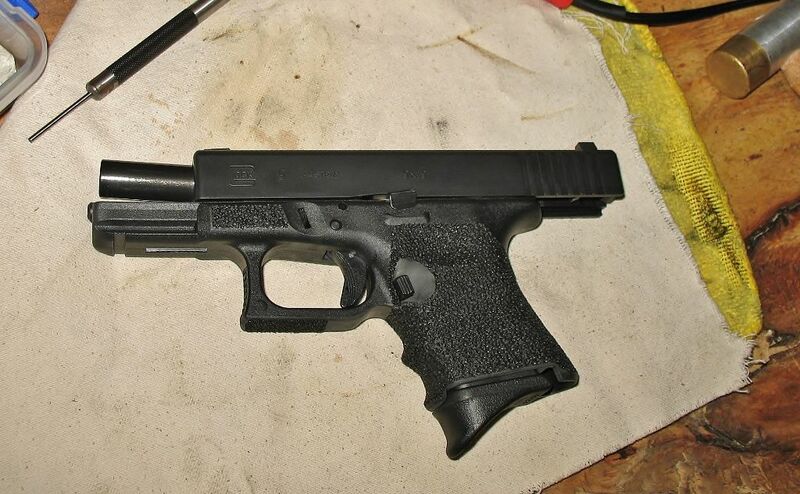 The extra weight of the 19 slide settles the gun down in a way the GLOCK 26 lacks. It conceals like a dream and the chopped grip never prints. Its also nice to carry a 26 mag as my second mag, cuts down the the weight and bulk of your backup mag. As an added bonus; if needed you can carry the 19 mag for 5 more rounds. I love this gun and everyone that has shot it agrees. I run into a lot of folks that ask why, but once they shoot it they notice it shoots far nicer than a 26 and locks into their hand. It is so easy to shoot and also easy to conceal. The GLOCK 43 is on the horizon and I waiting on mine to come into my LGS. If the 43 is all its cracked up to be, it will be a great pistol for the southern summers where shorts and flip flops are often the attire. It will also be far easier to conceal when wearing a suit. All that being said, I am in no rush. I love the 26L and currently looking for a good deal on a Gen 4 frame to make a secondary out of my RMR Gen 4 19. If you have the time and the means I recommend this crazy idea to anyone that will listen. I have been tossing around the idea of doing this myself, if I get my hands on a dremel and a g26 for measurements I may take on this feat of tenacity. Thanks for sharing!! Wow, your fun! I do know what it means – If you’re privy to something, you’ve been let in on a secret or know about something that most people don’t. Sorry about the inside joke. The 19 is known by a lot of our readers and friends as the best pistol ever made. We may be using it a little loose but it works. Looks great. Want to do mine? Negative. If you were local maybe but it’s not my line of work and not going to cut into a GLOCK frame without having insurance or you being a good buddy that lives next door. I know a gunsmith that does them. Jim Carollo at SpecDive Tactical in VA does them and you can send him your gun if you want – (703) 941-4867. I have been kicking around the idea of cutting down a 19 for a while now and your experience with 26L makes me believe now more than ever that I should give it a try. After all I have a Glock 30S that seems to me to be Glock’s version of this gun you have created, but only in a .45. I have also had the the thought that about the time I cut my 19 that Glock will release a 26L. I would think that there would be a decent market for this gun if Glock would build one.